Uber is now valued at $40 billion, which is amazing for a taxi company with no taxies, and Airbnb is worth $13 billion, which is a lot of money for a hotel chain with no hotels. That’s great! 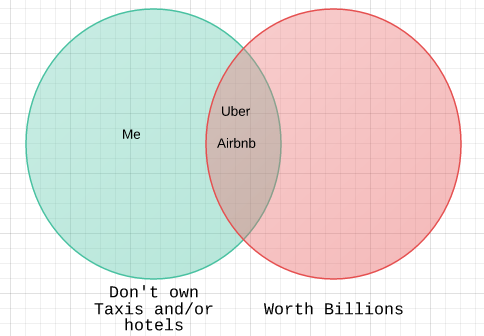 I don’t have any taxis or hotels either, so the venn diagram is looking pretty good. The sharing economy used to be famously hard to monetize — couch surfing didn’t cost anyone anything, and free-cycling didn’t allow for commissions. But Uber and Airbnb don’t really represent that at all, do they? Instead, they use the rhetoric of a “sharing economy” style service to socialize almost all the risks of businesses that traditionally require huge investments in infrastructure. It is, in some senses, an ingenious business model. But its also a riskier one than they might realize. Step 2 — ensure drivers and customers both carry personal GPS devices at all times. Also, make sure some kind of Global Positioning System exists. Step 3 — ensure drivers and customers carry online devices that allow for seamless billing at all times, or no one is going to be able to use our service. Step 4 — have people who can drive, and people who want drivers be a thing. Hey! It looks like we’re most of the way there. And we are. But that’s the problem — so is everybody. Step 6 — a user base. We need drivers to be common enough that people will want to use our service, and we need enough customers that its worth it for drivers to sign up. It doesn’t really cost us anything to sign up drivers, since they don’t actually work for us, which is a bit of a break. Otherwise, this is the same problem all networks have. Companies like this aren’t Amazon. They haven’t built giant logistical systems that would be difficult and expensive to duplicate. They don’t really “own” anything. They socialize the costs and risks of an enormous network (they don’t pay for the infrastructure they use, or the costs of maintaining an enormous workforce) and can make enormous amounts of money for a relatively small investment. But it also makes them extremely vulnerable. As much as Uber deals with its competitors in a famous fashion, and as much as it invests in lobbying to stabilize its legal position, the only advantage it really has over us is that we’re on step 4, and they’ve made it to step 6. That should be very worrying, since we covered the first four steps at the same speed we read them. Are those two steps worth whatever the difference is between $40 billion and what’s in my wallet? * This is an especially vexed question when we consider how dependent this kind of disruptive service is on a very specific regulatory environment. It might actually be best to think of these companies not as disruptive giants that have created a new industry, but potential Myspaces and Bebos. (Remember Bebo?) When you don’t own most of the user experience, competition becomes a serious problem — an Airbnb rival could offer the exact same properties, and many people already sign up for UberX and Lyft at the same time. You don’t really even control cost in that situation, and are instead forced to use slightly clumsy tools like surge-pricing, which is crucial to the business model, but not all that popular. Equally, while you can largely ensure service during a period of high growth, there is no long term mechanism for sustaining it. Uber in particular is extraordinarily vulnerable to falling out of fashion or a mass switching by drivers in one city. If Seattle Uber drivers really do want a union, it would now (especially given the legal ground Uber has carved out for the industry) be very easy for them to set-up a Seattle specific alternative. Uber could be cut out of a lucrative territory overnight, by a friendlier, more locally tailored option. The domino effect of that wouldn’t be encouraging either. Airbnb, Uber, Lyft and all companies in a similar space also have a real danger with service providerdisillusionment. No matter how much the customer base grows, if a significant enough proportion of the people who provide the service the company is nominally for (drive the cars, rent the rooms etc.) decide it isn’t worth the hassle and check-out, they are unlikely to check-in again. In a high-growth phase that isn’t a problem, but it means they need to balance the needs of two separate but totally dependent communities. Social networks have a hard enough time with one. Pulling it off requires some pretty excellent diplomacy. This has not always been obvious. So what does all this mean? Well, aside from suggesting that you should take any valuation of a “sharing-economy” company with a giant pinch of salt, it means that perception is unbelievably important. None of these companies can afford to alienate anyone in the long-term, because they are creating a huge gap for a competitor in the only field they can compete in. Even worse, a company like Uber may actually be damaging the long term prospects of its industry just by coming across as kind-of-jerks. Some of Uber’s legal battling to ensure it can operate will come down to money, but a lot of it will come down to how it is perceived by the general public. That’s not going brilliantly right now. In an environment where the value of the company is in large part based on the legality of its service (because it doesn’t really have any assets), it is very, very important that the reason people should support that legality is clear and convincing. If a public debate is ongoing, the last general reaction you want is “oh. I don’t like them. I don’t care if that’s banned”. This isespecially true in new markets where people haven’t necessarily even had a chance to use your service before the debate starts. And that’s where the controversies become a problem. They’re hardly deadly, not yet, but intimations of petty revenge, stalking, tragic price-gouging, misogyny and a general air of clueless-douchebaggery is a much, much bigger risk than it would be for a company with a more solid foundation. Take Google, not only does it take much greater care to cultivate a positive image, in search alone its comparative advantage is so huge that it has infinitely more space to manoeuvre with competition than an Uber or Airbnb. It has also been much more successful in identifying its own lobbying interests with generally popular ones, and while that isn’t easy, Uber’s self-inflicted wounds are just unnecessary. So socializing the costs of your company isn’t a bad business model, but it is a risky one. Few companies need to come across as angels as much as those that need to sustain their access to a socialized infrastructure. Few of them are trying. That becomes even riskier as the shine comes off the old “sharing economy” idea, and the benefits get questioned, and there are a lot of questions. Some of the less obvious socialized costs include the upward pressure on rents that people factoring in potential earnings from Airbnb can exert, or the end it puts to the days of “oh, I have a friend in that city you could stay with”. Even if that friend isn’t using Airbnb, their spare room has become a commodity with a price-tag. At the same time, companies like Uber and Airbnb are extremely dependent on operating in a largely de- or un-regulated space, and they need real public support to keep that open. Companies in this space need to come across as morally neutral at the very least, and ideally as actively positive — champions of consumer rights in the face of expensive monopolies. If you see a company that’s winning that argument, invest in them. Or, in a mild act of civil disobedience, get an Uber journey that spells out “come-on-guys” on a map. It might help. * in this case the difference is $40 billion.